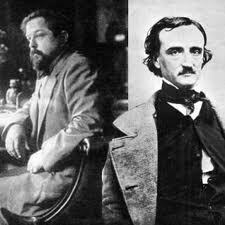 A dear friend of mine, James Reel, asked me if I was aware of Claude Debussy’s obsession with Edgar Allan Poe. I had no idea, but asked if Poe was France’s 19th-century answer to Jerry Lewis in modern times. More so, he answered, and so off I went to find out about this unlikely pairing, Claude and Edgar Allan. Sure enough, Debussy was mad for Poe and died while sketching scenes for the opera House of Usher. As a young man he had abandoned an opera on the Devil in the Belfry. What was the reason for Debussy’s madness? Charles Baudelaire can take a great deal of the blame or credit. He, too, became unglued with Poe’s short stories and spent his last years translating Poe’s tales. He was fascinated with Poe’s straightforward use of events to create impressions of modernity. Poe’s Man of the Crowd exhibited this modernity comparing the different responses of different classes of people having their paths obstructed on a busy street. In his words: The businessmen evinced no symptoms of impatience, but adjusted their clothes and hurried on, while others redoubled their gesticulations, and awaited, with an absent and overdone smile upon the lips, the course of the persons impeding them. If jostled, they bowed profusely to the jostlers, and appeared overwhelmed with confusion. What a grand idea to put Edgar Allan and Claude together and see what impressions they’d make on one another. I chose a dozen or so of Debussy’s impressionistic modernities, his piano Preludes, as interludes, interjections, between the short vignettes.